Lake Mary dental patients are enjoying straighter teeth and a healthier bite thanks to Invisalign® Provider, Dr. Rachna Ranjan. Invisalign® is a well-known brand of clear braces that helps patients get straighter smiles without the bulk of traditional braces. At our Lake Mary dental practice we are proud to have Dr. Ranjan, who has been recognized as a premier Invisalign provider in the area and continues to correct smiles for patients who choose this alternative clear aligner procedure. If you’ve always wanted beautifully aligned teeth, and a picture-perfect smile, treatment with Invisalign® can help you meet your cosmetic goals. Consultation: During this appointment, Dr. Ranjan gets to know you to better pinpoint areas of concern. After this discussion, our team will be able to design your treatment plan to affectively address your dental problems. Impressions: When you’re ready to put your treatment plan into action, you’ll visit our office to have digital impressions taken of your smile. This information is sent to Invisalign®’s laboratory, where they plot out the movement of your teeth, and create custom aligners to fit your smile at each stage of treatment. Fitting: Once your clear braces have been created, they’ll be sent back to our office so you can receive your first set. Dr. Ranjan will help you pop the aligners in for the first time, and tell you how to get the most out of treatment, such as wearing your aligners for at least 22 hours and day. Follow-Up Visits: You’ll come back to our office one every two weeks or so to get the next set of aligners and have your progress reviewed. Your treatment will move forward in this way, with routine follow-up visits, until you reach the end of your dental care plan – about 12 months for most patients. 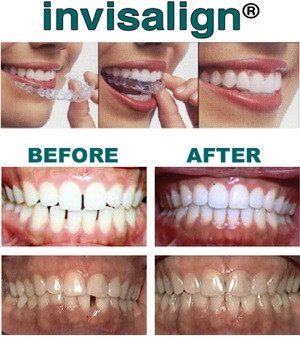 Invisalign® is perfect for both teens and adults --- because it is almost invisible, you can feel confident about your smile in social and professional situations; there are no wires or brackets on your teeth to make you feel self-conscious. As with any orthodontic treatment, there is some discomfort associated with teeth moving into better alignment. However, for most patients, this discomfort is associated with the time during which they get new aligners; any pain subsides after a day or two of wearing your aligner trays and can be effectively controlled with over-the-counter pain medication. Invisalign® is made more comfortable by the fact that the aligner trays are smooth – there are no metal components that will cut or scrape tissue on the inside of your mouth. Invisalign® is also removable and should be taken out during meal times; you don’t have to worry about injuring lips or cheeks while trying to chew with a mouth full of metal. Our Invisalign® dentist will work closely with you during treatment, to ensure that you’re comfortable and relaxed and that all of your dental concerns are addressed. Dr. Ranjan has been designated as a PREFERRED PROVIDER by Invisalign® in 2014! If you have questions about how you can get Invisalign® in Lake Mary, contact our Preferred Provider office today for more information or to set up your consultation. Our competitive treatment fees include the retainers necessary at the end of orthodontic treatment PLUS FREE WHITENING post-treatment!